Box Text: Baba Is Puzzle. Baba Is Rules. Baba Is You. 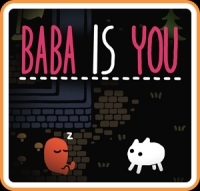 Baba Is You is a puzzle game where you can change the rules by which you play. In every level, the rules are present as blocks you can interact with; by manipulating them, you can change how the level works and cause surprising, unexpected interactions! With some simple block-pushing you can turn yourself into a rock, turn patches of grass into dangerously hot obstacles, and even change the goal you need to reach to something entirely different. This is a list of VGCollect users who have Baba Is You in their Collection. This is a list of VGCollect users who have Baba Is You in their Sell List. This is a list of VGCollect users who have Baba Is You in their Wish List.